Very cool pic. Make it an advertisement! Are you sure? Because they changed the law when we lived there. You could by it (at pharmacy, and give your PR care #)but only for personal use, not to sell. We knew many friends who went to Johor to buy some, it's not illegal as long as it's just for your use. that's what everyone thinks, that personal consumption is ok. but technically the law does not provide for it. i was told. A timely post. Today when I mentioned to a Finn that I was from Singapore, she mentioned the chewing ban. Told her personal consumption was ok, oops... Now i definitely know it's illegal. Thanx. I always thought bringing in chewing gums for personal consumption is not illegal. Go to a Guardian pharmacy and ask the pharmacist whether there is gum for sale. I read in the news shortly after we've moved that gum was now for sale for personal consumption, but you have to sign something and give your PR #. we all think so too. the gums at the pharmacies are therapeutic like for those who wants to quit smoking type of gums. the normal chewing gums are not sold. I do like chewing gum! 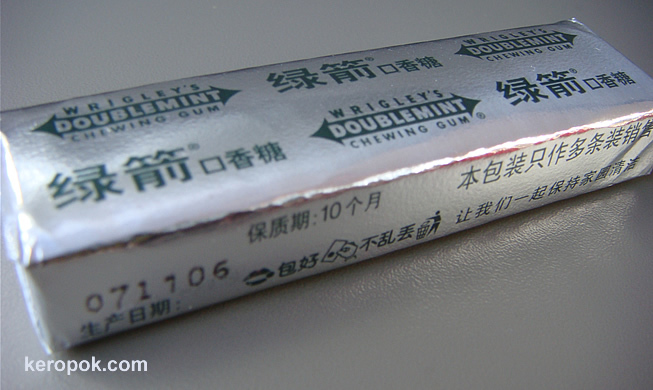 Used to like chewing gum - especially Wrigley's Spearmint gum. A gum after a meal is certainly refreshing. But now I switch to candies.